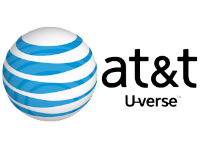 A set of leaked internal AT&T training documents obtained by TorrentFreak reveal that the Internet provider will start sending out anti-piracy warning notices to its subscribers on November 28. Customers whose accounts are repeatedly flagged for alleged copyright infringements will have their access to frequently visited websites blocked, until they complete an online copyright course. It's expected that most other participating ISPs will start their versions of the anti-piracy plan on the same date. Last year the MPAA and RIAA teamed up with five major Internet providers in the United States to launch the Center for Copyright Information (CCI). The parties agreed on a system through which subscribers are warned that their copyright infringements are unacceptable. After several warnings ISPs may then take a variety of repressive measures to punish the alleged infringers. Thus far the participating Internet providers have refused to comment to the press on any of the details including the launch date. But, leaked internal AT&T training documents obtained by TorrentFreak provide a unique insight into the controversial plan. The documents inform AT&T staff about the upcoming changes, beginning with the following overview. The papers further reveal the launch date of the copyright alerts system as November 28. A source connected to the CCI previously confirmed to TorrentFreak that all providers were planning to start on the same date, which means that Cablevision, Comcast, Time Warner Cable and Verizon are expected to have a simultaneous launch. The training documents also give insight into the measures AT&T will take to punish those who receive a 5th and 6th alert. When repeated infringers try to access certain websites they will be redirected to an educational page. 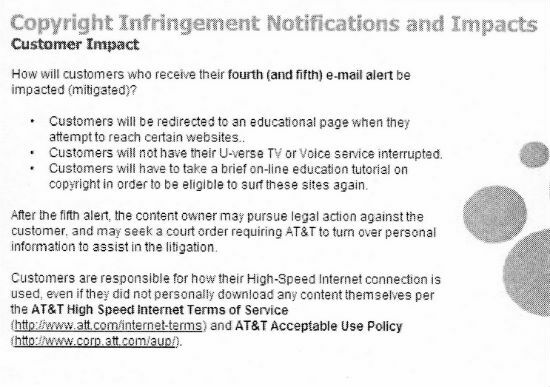 To lift the blockade, AT&T will require these customers to complete an “online education tutorial on copyright”. The training does not give any information on what sites will be blocked temporarily, but it’s mentioned that “access to many of the most frequently visited websites is restricted”. What the copyright education tutorial entails remains a mystery. Under the agreement Internet providers were free to choose how to punish repeated infringers. The above confirms that AT&T decided to implement a targeted website blockade combined with a copyright course, as opposed to other repressive measures such as throttling the connection speeds of subscribers. While there are worse punishments one can think of, AT&T worryingly notes that the alerts may eventually result in a lawsuit. “After the fifth alert, the content owner may pursue legal action against the customer, and may seek a court order requiring AT&T to turn over personal information to assist the litigation,” AT&T explains. As we reported previously, under the copyright alert system Internet providers have to inform copyright holders about which IP-addresses are repeatedly flagged. The MPAA and RIAA can then use this information to ask the court for a subpoena, so they can obtain the personal details of the account holder. While there’s no concrete indication that repeated infringers will be taken to court, the clause would not have been included in the agreement if the copyright holders aren’t considering it. Meanwhile, TorrentFreak is getting reports from VPN and proxy providers who have seen a significant uptick in new subscribers from the US. Presumably, a large percentage of these new subscribers are signing in anticipation of the “six strikes” scheme.